The fourth series of Banknotes issued by Canada was called as the “Scenes of Canada” series. These series of Canadian dollar issued by the Bank of Canada was first circulated in 1970. As the name suggests, the banknotes from series depict some picturesque landscapes of Canada. The note shown in the picture depicts on its obverse a portrait of Sir John Alexander Macdonald, the first Prime Minister of Canada to right with the Coat of Arms of HM Queen Elizabeth II at left. The reverse depicts a Polymer Corporation oil refinery in Sarnia, Ontario. 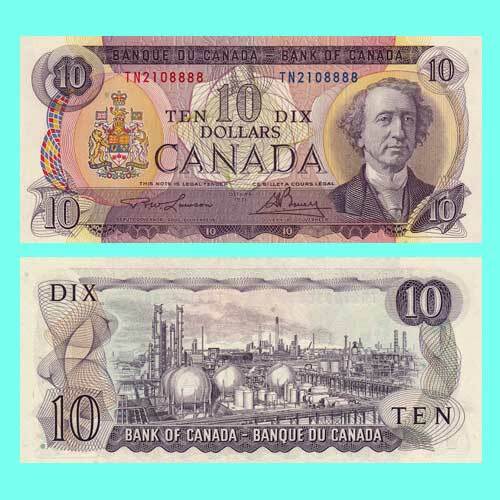 The $10 banknote was first circulated in November 1971, and was printed by Canadian Bank Note Company Limited, Ottawa.